The other day at our food blogger’s luncheon, I had thanked food blogger Lisa Dearen (Whisk and Cleaver) for her lovely comment she made during our the last meeting. She said that as a blogger “she cooks from her own blog “. Well, that thought stayed with me for a long time, because that’s exactly what I do. And this recipe is my weekly go to meal at my house. 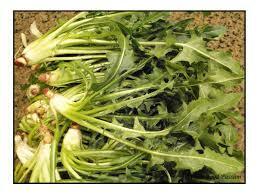 Radiki, are dandelions quickly boiled in water, and doused in olive oil and lemon. Also, it’s the traditional green dish found in Greece. My mother would stop along the roads to and from work looking for dandelions in the fields of our small town. I will never forget the time she stopped behind my high school, (with me in the car) in a dress, and ran up to the field and brought back with her a handful of freshly picked weeds! Yes, weeds that grown wild where we live. But I have to admit they are an acquired taste. Not only are they nutritional but I’m convinced they are a powerfood for our bodies. According to Dr. Joel Fuhrman, M.D, from Eat To Live, plant foods have tons of protein, including eight essential amino acids. A good example is one cup of spinach has 5.4 grams of protein and let’s not forget calcium as well. He also claims dark leafy greens such as kale, mustard greens, collard greens, swiss chard, watercress, spinach and arugula have the highest nutrient density score (100), which identifies phytochemicals, antioxidant activity, and total vitamin and mineral content. Now back to radiki. Greeks have been eating dandelions for centuries. 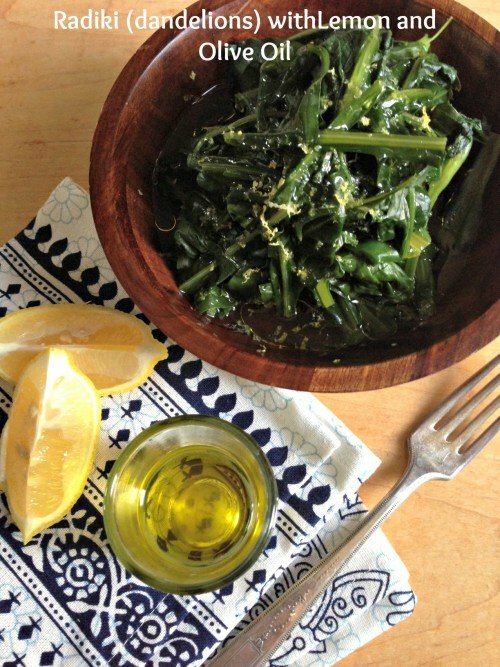 These bitter greens are served all over the countryside and in the cities as a side dish with your meal. Often too bitter to eat fresh, they are boiled and served with lemon and fresh olive oil. Horta, often interchanged with radiki, is a mixture of greens prepared the same way as radiki, or sauteed in a frying pan with garlic and olive oil. I do find the dandelions bitter, so I do mix in whatever greens I may have on hand like spinach, swiss chard, baby kale, mustard greens or arugula with the dandelions. The official name for dandelions is “Taraxacum Officinale” and information about dandelions can be found here. Add dandelions to your main dishes such as pizzas, eggs, or salads for a healthful twist- and don't forget to use a dash of lemon and extra virgin olive oil for added flavor. Rinse dandelions in water and drain. Cut off the bottom roots and coarsely chop. Place a medium pot on to boil, add dandelions and reduce heat to simmer. Cook for 5-8 minutes,making sure greens have softened. Add back 1 cup of juice, extra virgin olive oil, juice of one lemon, salt and pepper. Add zest to the top when ready to serve. Note: With the extra water add lemon juice and olive oil and drink in the morning as a pick me up! Even better when you heat it up! Enjoy! These are just picked dandelions! I’m a Greek girl in the OC and have been enjoying your food blog for sometime. I’m a fan of dandelions too (although as a kid growing up I would eat the smallest portion possible to satisfy my mom). Now I have it all the time and one of my favorite ways (I think only a Greek could come up with this one!) is in a green smoothie!!! I freeze whole figs when they are plentiful (another favorite of mine) and during the year toss a couple into the VitaMix with a handful of washed dandelions, tsp ground flaxseed, maybe a little unsweetened shredded coconut and a scoop of vanilla protein powder. Green goodness! Your recipe sounds delicious- with all my favorite ingredients. Love figs in my smoothies, and now I have a new recipe! Thanks so much for taking the time to write me! OPA! I have been eating dandelions my whole life. I also like collards and rapini. So have I George, maybe that’s why we’re still around! LOL! I like the dandelions the same way I have always eaten them, boiled with olive oil lots of lemon juice and a touch of sea salt. You got that right! It’s such a healthy dish cold or hot! My mother would save the juice and drink it the next day with a splash of lemon.